Late one night Hajiya Binta Zubairu is awoken from her slumber to discover a burglar in her house. The young burglar, Hassan “Reza” Babale, struggles against Binta, eventually leaving with her DVD player, decoder, and other items. 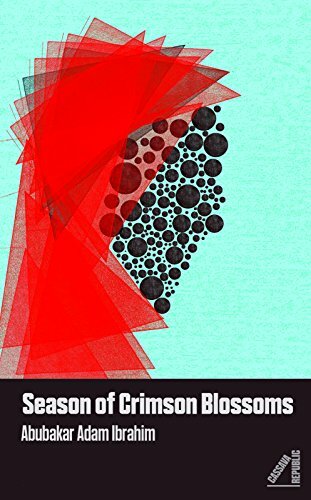 Beginning with this minor incident of juvenile criminality, Season of Crimson Blossoms by Abubakar Adam Ibrahim moves forward at an unhurried pace. Set in a small village in rural Nigeria, Season becomes an unlikely story of romance between Binta and Reza. Binta is a 50-something widow living alone until her grown daughter disrupts her solitude. Her daughter, Hadiza, decided to leave her husband in the latest spat. Reza is the leader of gang occupying an abandoned building. Reza and the gang dubbed the building San Siro after their favorite Italian soccer team. Set against a background of political violence and domestic squabbles, Binta and Reza carry on a taboo affair. Binta is a respected member of the community, regularly attending classes at the madrasa, and a devout Muslim. On the surface the May-December romance would be nothing more than something found on Amazon Kindle between a cougar and a stud. But Ibrahim elevates this odd romance into something greater and far more complicated. Binta finds herself attracted to Reza since he resembles her dead son. Mirroring this is Reza’s attraction for Binta since she looks like his dead mother. When he was young, his mother abandoned him to live in Saudi Arabia. He has never gotten over this abandonment, forever referring to his mother as the “whore of Saudi.” Ibrahim balances these coiled and contradictory emotions with a frank depiction of sexuality for an older Muslim woman. Binta’s conflicts arise from her very human desires and the taboo nature of her illicit affair with Reza. Because the punishment for adultery is severe in the Muslim portion of Nigeria, the stakes are incredibly high. But the complications don’t end with the Binta-Reza affair. Her son is trying to arrange a marriage with an elderly man obsessed with BBC Radio. Meanwhile, the local senator will use Reza and his gang as political rabble-rousers. In Nigeria the political class uses its connection to criminal gangs to intimidate opponents. The nation itself is divided between Christian and Muslim sections. Binta’s family fled to a small village to escape the periodic flare-ups in Jos, Nigeria. Her husband was killed in one of these clashes. Whether from a politicized mob or a criminal gang, death is ever present in their daily lives. Season is written in a gorgeous tapestry of language, tying together large-scale historical events with the smaller more mundane activities of daily life. The novel sprawls like a work by Dickens, Zola, or John Lanchester. Ibrahim begins each chapter with a teasing epigram like, “A snake can shed its skin, but it will still remain a serpent.” Taking its time, the slow methodical pacing allows the novel to breathe. This allows the relationship to develop in a natural and realistic way. Numerous passages like these resound throughout the novel, melding a folktale lyricism to an ornate language. Abubakar Adam Ibrahim represents a talented new voice in contemporary Nigerian literature. He has created a crowded milieu, brimming with characters, set amid the political violence of Muslim Nigeria.